Be the first to know what's happening in Slack. Chronicle provides events to a private group to make managing Slack easier so you can focus on saving the world. Chronicle can help you easily archive inactive channels in a single easy-to-use interface. Monitor every channel in one channel. Chronicle can make monitoring your Workspace with a simple powerful message monitoring utility that can analyze every message for you. Use Chronicle on an Enterprise Grid or multiple Workspaces. Chronicle has built-in support for Enterprise Grids and multiple Workspaces to provide a fluid experience. Effortlessly keep your workspace active. Slack makes it easy to create channels, but often a channel will slowly go out of use. Chronicle helps by providing an easy-to-use interface to manage channels that haven't had any activity in a while. This function is called the Manual Archiver. There are three main groups channels with activity in the last 7 days, no activity in the past 7 days, and lastly no activity in the past 30 days. You can find detailed information about each channel in these categories. If you have a channel that you wouldn't like to show up as inactive, you can click the ignore button to permanently ignore it in archiving scans. Keep an eye on every channel in one channel. Sometimes you may want to know when someone shares secure credentials in public channels or uses inappropiate language. Chronicle remedies this problem by providing the Message Monitoring tool. Message Monitoring provides a very simple, flexible, and powerful way to monitor messages. 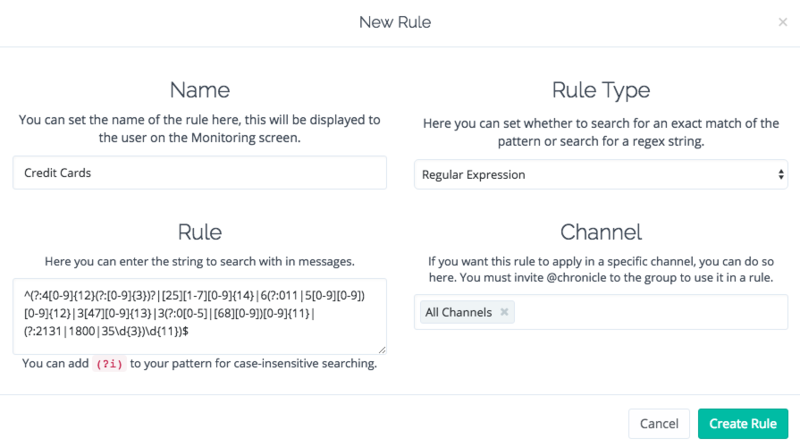 You can setup a message rule in the admin interface, each rule has four attributes: name, rule type, rule, and channels. The name is the name of the rule you wish to use. The rule type defines what the rule will match, it could be an exact match, a case-insensitive match, or a very powerful regular expression. The rule is what will be matched. Lastly, the channels specifies where this rule will be applied, it can be all channels, non-ignored channels, groups, channels, or any combination of channels and groups. Every rule is tested on every message sent in your workspace as long as the rule applies to the channels it was sent in. Every rule can be toggled on and off and edited. You can also have any amount of rules. Get regular reports on inactive channels. The Manual Archiver is great but has one flaw, it's manual. The Scheduled Archiver makes using the Manual Archiver feature more natural. Every day, week, or month you can receive a report detailing what channels are active, slightly inactive, or very inactive. You can then archive all the inactive channels there, ignore them, or view more information online. Use an Enterprise Grid or as many workspaces as you wish. 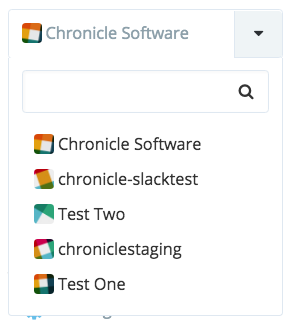 Chronicle has support from the ground up for multiple workspaces and Enterprise Grids. After adding your first workspace you can add as many as you like. When a Enterpise Grid workspace is added Chronicle automatically acquaints itself with the Enterprise Grid and allows billing to be grouped into a single account rather than an account for each Enterprise Grid workspace. Make sure all your channels are active without doing anything. Sometimes those reports from the Automatic Archiver may become too cumbersome, this is where the Automatic Archiver comes into play. Once every day it will check every channel and post in that channel if it's inactive. The threshold of how many days must go by with no activity for a channel to be considered inactive is variable. After it sends the message in the inactive channel, it will automatically archive it in three days unless someone selects one of the buttons below it or sends a message in the channel. There are three buttons, one to archive it immediately, wait until it's considered inactive again, or to permanentely ignore the channel. Using the Automatic Archiver over the Scheduled Archiver may be favorable because it leaves the decision about whether a channel should be archived or not to the people that are in the channel. Free trial, no credit card. Every team will have a free 30 day trial for paid plans. A credit card is not required during the free trial. Every plan has access to every feature. Just create an account with your email and password. Just connect Chronicle to your slack instance so we can monitor for events you select. 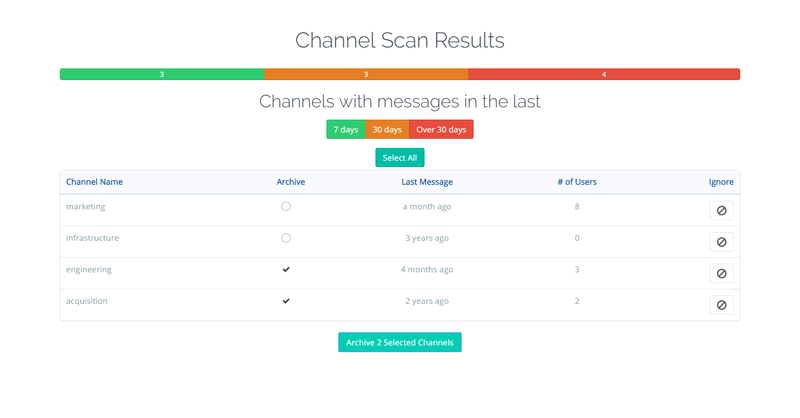 Adjust the events to monitor - and scan for any unused channels you can archive.